TALLAHASSEE, Fla. (Legal Newsline) - Law firms and lawyers continued to support Charlie Crist in May, helping the Democratic candidate for Florida governor raise more than $2 million. Crist, who will face Gov. Rick Scott in the general election, received around three-dozen donations from attorneys and law firms last month, campaign finance records show. -An $86,000 donation supplied by Grossman Roth, a Coral Gables law firm. -Lucas, Green & Magazine, New Port Richey, $5,000. Since the start of his political career as the Republican attorney general of Florida in 2003, trial lawyers and law firms have been among Crist's top supporters, accounting for millions of dollars in donations in state elections, campaign finance reports show. 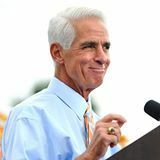 Some of the larger donations Crist received in May from individual Florida attorneys include a $25,000 from Robert Rubenstein; a $50,000 donation from Benjamine Reid; and a $25,000 donation from Stanley Rosenblatt. Crist, the former Republican governor of Florida, flipped parties in 2012. He declared his intentions to seek the Democratic nomination for governor in November and has since netted around $10 million in campaign contributions, according to the Florida Department of State. Although attorneys and law firms account for half the total amount Crist's PAC raised in May ($1,648,544.86), the largest individual donation came from not an attorney, but a Chicago media mogul. On May 14, Fred Eychaner, chairman of Newsweb Corp., donated $200,000 to Charlie Christ for Florida, campaign finance reports show.